Thunder Downunder 2000 ( TDU2K ) was the third in an annual series of chases, and in the opinion of most participants the most successful. I was able to chase for a week and only the return home day was a bust. The following is my diary of the event. 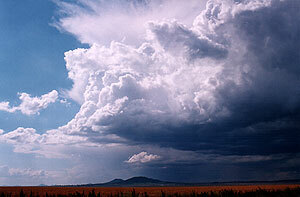 Day 1, 25th November 2000 - Home to Coonabarabran, 579kms, Weak storms. 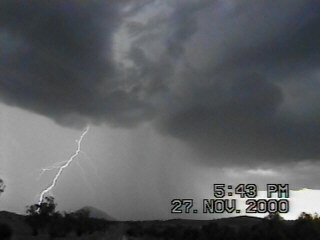 Day 2, 26th November 2000 - Coonabarabran to Narrabri, 327kms, Multicell Storms - some severe. 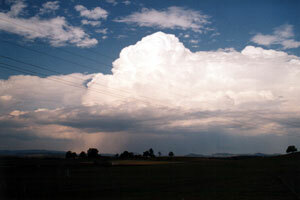 Day 3, 27th November 2000 - Narrabri to Glen Innes, 400km, Severe multicell storm. 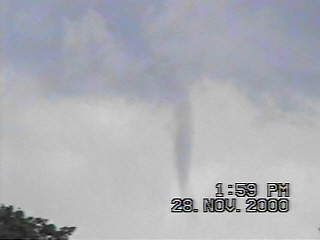 Day 4, 28th November 2000 - Glen Innes to Gunnedah, 387km, Severe microburst from multicell storms. 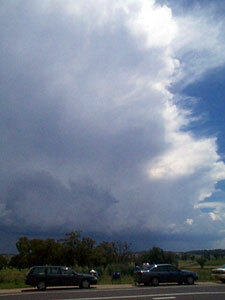 Day 5, 29th November 2000 - Gunnedah to Gunnedah, 250kms, Severe storms widespread throughout eastern New South Wales. We encountered a severe multicell near Gunnedah. Day 6, 30th November 2000 - Gunnedah to Gunnedah, 350 kms, Two non-severe storms. 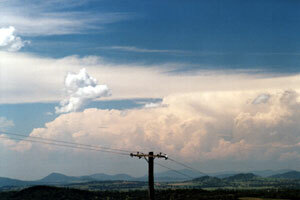 Day 7, 1st December 2000 - Gunnedah to Hastings Point, 579kms, One weak storm, close to a severe storm. 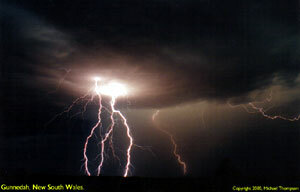 Other Thunder Downunder chase reports. Matt Smith's Thunder Down Under 2000 - Matt has some excellent photos in his comprehensive report. Be sure to check the pics of the rotating updraft and wall cloud on page 2 of his report. Andrew McDonald's TDU2K - Another excellent and informative report. Superb digital video stills ( I want one ). Jane O'Neill's Thunder Downunder 2K photos - lots of pics here. Even yours truely gets a showing. Jimmy Deguara's Thunder Downunder - extensive report in three episodes.